I love the look of false lashes. Dramatic, fluttery, movie-star-esque… but I cannot stand the faff. I am not a faffy girl. I don’t do heels, I don’t do lipstick, and as much as I love fashion it has to feel good for me to wear it. That’s why my love affair with false lashes began and ended at a New Year’s Eve party – I felt like I had an irritating feather placed over my eyes and couldn’t wait to get them off, yet had to keep re-glueing them to save from ‘what’s that furry thing on your cheek?’ embarrassment throughout the night. Now, I stick to mascara and what dear old (stingy) Mother Nature gave me. A girl’s search for the perfect mascara is a lengthy one. We want them long but thick, separated but plenty of them – our lashes, that is. At the moment I swear by Max Factor’s Lash Extension mascara mixed with the Masterpiece Max, but move over Max Factor: there’s a new mascara must-have in town. 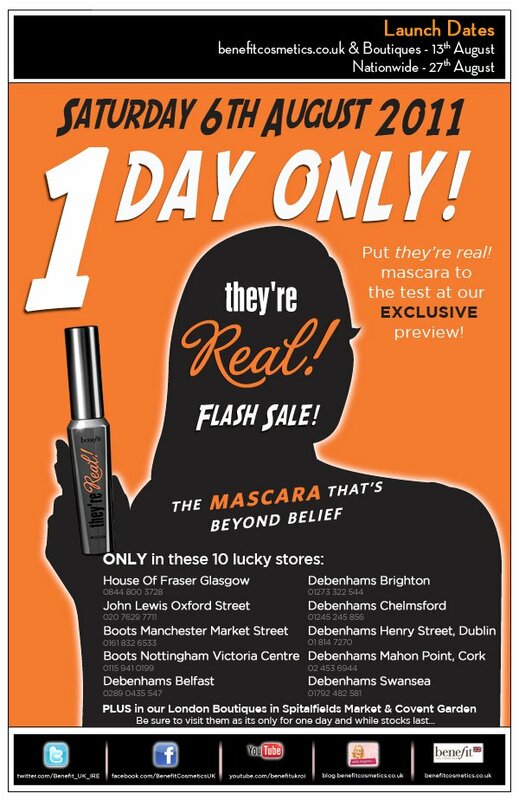 Benefit, one of my favourite beauty brands, are about to unleash the They’re Real! mascara and from the look of some tried and tested posts on beauty blogs such as Lipglossiping and these videos, it’s going to be big. It claims to give you lashes that look so good people will think they’re fake. The recipe itself curls so you can ditch your scary looking eyelash curler, and it has long and short bristles on the brush so even the tiniest of lashes are reached. It also has bristles on the end of the brush to give extra lift. Convinced? These babies go on sale from 13th August but they are having a flash sale on Saturday 6th August if you just can’t wait – see the flyer below. Happy fluttering, and let me know what you think! This entry was posted in beauty, Benefit, lashes, lifestyle, mascara, Max Factor. Bookmark the permalink. ← Unpaid Internships: Write or Wrong?